The Guerrilla Gourmet: Some plans brewing for the New Year! I hope you enjoyed your Hopping John this year, we sure did. Check out the recipe (via Bryant Terry) here. Our first order of business, of course, is to keep on cooking, but we've also got some more detailed projects. See the details after the jump! 1) Every gardener knows that January is the month for plotting and planning, and we'll be going over seed catalogs and calendars to plan the coming year's vegetable garden. Beets, peas, and zucchini were all stars last year and I'm sure they'll be back, but we'll keep you posted on any newcomers. 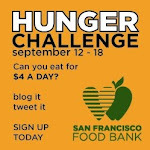 2) Last Semptember, we accepted the San Francisco Food Bank's challenge to live on a typical food stamp budget ($4 per-person, per-day) and now we're going to take it to the next level by cooking on the same budget for the whole of Lent! That's $320 to feed the two of us for forty days. We hope to learn a little bit about just what it means to deal with "food insecurity", and to come out of the trial with some more tools in our frugal cooking tool belt. 3) One of those tools will be the Guerrilla Gourmet's very first cookbook! Or, rather, cook-PDF. We'll collect some of our favorite frugal dishes to share with a hungry world! That's all we have for now, but check back often in the future to see what's new. And if you have any ideas, as always, leave us a comment!